NOTE: DivShare has been acting up (again) and a good chunk of my audio has disappeared. Sorry if you have tried to listen to the samples and instead hear the the sound of silence. Going through the monstrous task of moving over all of the DivShare audio on here to my own hosting and embedding my own player. I'm a sucker for the whole song-poem genre. For those unfamiliar, the concept was this: Write a song (or poem), then pay a company to take your composition, set it to music, back it with studio singers and a band and viola, you have a record! Check out the outstanding American Song-Poem Music Archives site. Take for example Virginia Unrein of Montrose, and her ode to her nautical love, Sailor Joe. Listen to a sample of "Strange Music"
No idea on when this was recorded, or who the studio singer is. 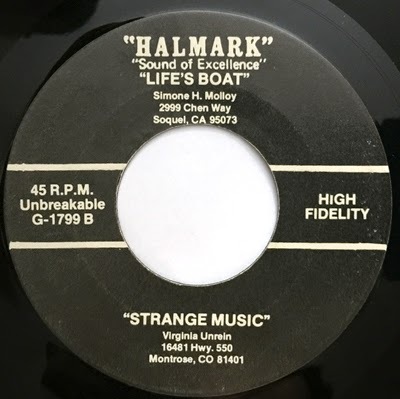 Virginia's song appears to be part of an EP with three other folks who handed over a few hundred bucks to the prolific Halmark label. Virginia left this world in 2013. Her obituary mentions that she "successfully wrote and published several of her own songs on CD."